Sometimes musicians are creative. Other times they are original. Occasionally they smash thru the basic trapping of genre rules and create category defying experiences unlike any other. The critically acclaimed Blue Man Group is just such a performance experience. Perhaps you first saw BMG on those unique Intel Pentium television commercials, or maybe you have seen them on one of their numerous “Tonight Show” appearances, (13 to date, see www.bluemanlibrary.com). Or maybe you were one of the lucky ones to see their crowd pleasing set on “Moby’s” AREA 2 tour in 2002. Perhaps you have visited one of their permanent locations and witnessed their great theatrical performance. Where ever you may know them from, their trademark cobalt grease paint faces, funky yet technical performances and PVC drums leave an indelible impression. The founding three members of BMG, Chris Wink, Matt Goldman and Phil Stanton started creating their own unique brand of multisensory experiences as early as 1988 on the streets of New York. Then, after a breakout run at LaMama (New York’s most prestigious experimental theatre) in 1990, they landed in the Astor Place Theatre in 1991 and have been there ever since. With this flagship venue in place, BMG kept expanding into more major market areas. To date BMG has permanent locations in New York, Boston, Chicago, and Las Vegas, with plans for a new Berlin troupe set to open in 2004. The organization has grown into a franchise comprised of over 500 employees including nearly 100 performers and musicians. BMG’s musical side was first recorded for mass public consumptions in 1999 with the release of the Grammy nominated instrumental album “Audio.” (Virgin Records) “Audio” showcased many of the instruments that BMG has invented or modified and uses in their shows. Things like the Drumbone , the Airpoles and the Tubulum along with the show stealing Piano Smasher (a piano stripped to its metal frame and soundboard and is smashed with a giant mallet) are just a few of the unique audio treats in store for the listener (and concert goer). After studying the rock genre, BMG has expanded on not only the boundaries of theater, and performance, but what is technically and physically possible in the rock arena. Co-founder Wink states, ” Our concept from the beginning was to make a record that would fuel a ground breaking rock concert experience.” The current tour therefore in support of that amazing album “The Complex,” (Lava Records) which the band says is their “first full-fledged entry in to the Music World.” The tour has thus appropriately been dubbed “The Complex Rock Tour.” On stage, the 3 non vocal blue men are backed up by a highly percussive band, and the show features guest performances by Tracy Bonham and Venus Hum (who double as the opening acts for the tour). If you missed their performances in Chicago or Milwaukee on the first leg of the tour, don’t give up hope. 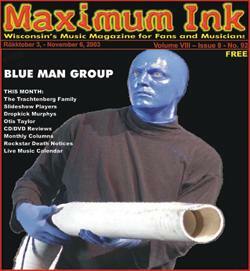 Blue Man Group will be performing 10/22/03 in Madison, WI at the Kohl Center. Be there.